Aldershot Town loan signing Danny Rose hopes he can play a part in moving the club up the table. The Shots currently lie in the League Two relegation zone. The midfielder told BBC Surrey: "The margins by what they have lost games are not much. Hopefully in the next few weeks we can turn that around. "It may take two or three games but I put pressure on myself to play well and keep a certain standard of high quality and consistency." The 24-year-old linked up with the Shots on a three-month deal from Fleetwood Town this week. The former Manchester United trainee joined the Cod Army from Newport in January and played a part in their promotion to the Football League. 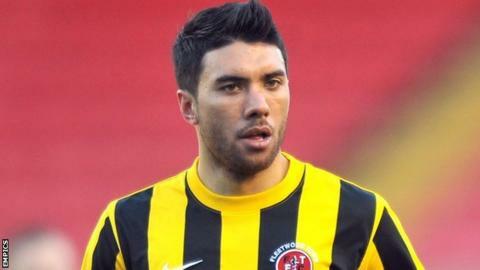 However, Rose has not featured for Fleetwood in the new campaign and is now looking to prove himself at Aldershot. "I've not played for the first team this season and looking back on the move it was kind of a mistake," he said. "The one positive is it has got me into the Football League and it's ended up with me coming here. I've managed to keep myself fit and played a few games here and there. "[Playing in the Football League] was my ultimate aim. That's why I held out and didn't go to a Conference club, which was an option for me. "My aim was to play in the League and I'm very glad I held out as long as I did. "There was interest in the summer and I know Dean [Holdsworth] has always wanted to get me here, but for different financial reasons and certain circumstances it wasn't to be. "Finally we've managed to do it."